Located in the Castello di Grinzane Cavour, Alessandro Boglione’s Ristorante al Castello is one of the prettiest dining rooms in Piedmont. The menu is steeped in the classics, with a few innovative touches. Piedmont has a lot to offer the tourist, including world-class wines, fabulous food and picturesque hillside towns. But one thing the region lacks is sights that might appeal to the visitor interested in more than just food and wine, something other regions like Tuscany offer in abundance. The Castello di Grinzane Cavour is steeped in history. The castle is most famous for being the residence of Count Camillo Benso di Cavour, Italy’s first Prime Minister and a central figure of the unification of Italy. Today, the castle houses the Enoteca Regionale Piemontese (the first of its kind), two museums, a café, and the more formal dining room that has been run by Chef Alessandro Boglione for about the last five years. The exposed brick walls and spacious tables create a feeling of intimacy and warmth at the same time. Boglione’s menu offers the classics along with a set of more creative, innovative dishes. When I am in Piedmont, though, I usually crave the local specialties. This simple, informal lunch is superb. 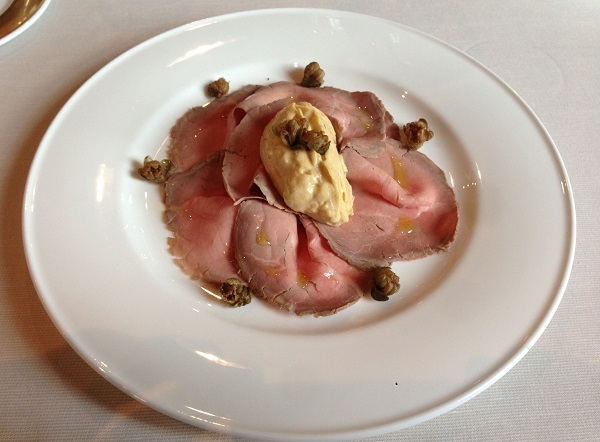 The Vitello Tonnato is tasty, although my personal preference is for the veal to be cooked a little less. The crunchy, fried capers contrast the creaminess of the tuna sauce nicely. Boglione’s paccheri with Osso Buco ragù is a big hit. This is classic, stick-to-your-ribs winter food at its best. 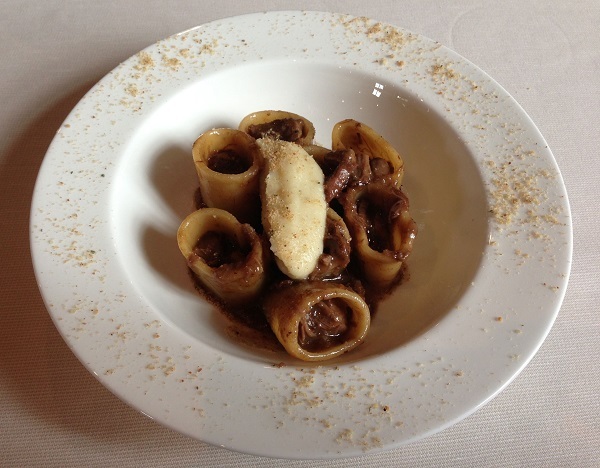 The paccheri are cooked perfectly al dente, while the Osso Buco is wonderfully creamy and textured. One of the things I love most about the Piedmontese kitchen is the way the classic dishes act as perfect canvases for the region's wines. When the food and wine are both on in Piedmont, well, there aren’t too many things that can compete. The 1981 Le Pergole Torte is simply stunning, especially considering its age. Sweet, layered and impeccable, the 1981 graces the palate with an exotic mélange of licorice, smoke, herbs and dark red stone fruits. I love the way the 1981 opens up in the glass. What a gorgeous wine! Giuseppe Mascarello’s 1979 Barolo Vigna Rionda is a historical curiosity. In 1979, Bruno Giacosa thought the Rionda fruit was too expensive, so he passed. Mauro Mascarello bought the grapes instead. When he vinified the fruit, Mascarello was alarmed by how little color the wine had. 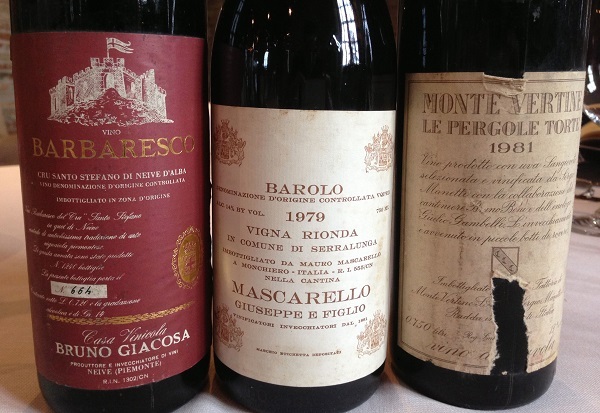 The following year, 1980, in what has turned out to be a vintage with some positive surprises, Mascarello had the first shot at the fruit, but he wasn’t thrilled with his 1979, so he let the fruit go. The rest, as they say is history. Bruno Giacosa went on to make some of his greatest wines from these grapes. Today, Mascarello’s 1979 Barolo Vigna Rionda remains dark, imposing and tannic. It’s hard to know how significant the vintage influence is with just one wine, but the Mascarello Rionda presents a distinctly masculine, virile side of Rionda. Dark cherry, plum, smoke, tobacco and dried roses inform the finish. The 1979 should continue to age well for years, although there isn’t much if any upside in keeping bottles. What a thrill it is to see Bruno Giacosa’s 1964 Barbaresco Riserva Santo Stefano on the table. Wow. This is Bruno Giacosa’s first formally declared single-vineyard wine. Just 1,240 bottles produced. I have had the 1964 many times, but now, at 50 years of age, it may be time to accept that the wine is fully mature. Still sweet, layered and perfumed, the 1964 is fresher on the palate than in the bouquet. It’s still a wonderful bottle, but not the best example I have had. It happens. Regrettably, this was a quick lunch, as I had a number of appointments in the afternoon, but I am looking forward to spending more time at the Ristorante al Castello. Chef Alessandro Boglione, who makes a point of greeting all his guests, has created a warm, welcoming environment that at its essence represents what hospitality is all about.